Mozambique's effort to become the first of the world's major mine-contaminated countries to be declared mine-free is faltering on the home straight. There are a variety of reasons: Mozambique's donor-dependent government no longer sees demining operations as a priority; the withdrawal of humanitarian demining operations, sending the wrong signals to donors that the job was done, and that the focus of global demining activities has largely shifted to Iraq and Afghanistan. "We can finish this. We can get rid of them [landmines] ... This is not a never-ending story," Aderito Ismael, Mozambique's Mine Action Coordinator for Handicap International (HI), a non-governmental organization, told IRIN. "I want to be out of a job by 2013, or maybe by 2012." Handicap International, one of three humanitarian demining operations still working in the mine-infested territory, is only continuing operations through the support of the UN Development Programme (UNDP), while the HALO Trust - Mozambique's largest humanitarian deminer - is working below capacity because of funding shortfalls. APOPO is the third and smallest of the operations in the country. When demining activities began in 1992, predictions were that clearing anti-personnel landmines and unexploded ordnance left by four decades of independence and civil wars could take about 50 years. "Mozambique could set an example of a country significantly affected by mines ... ticked off as cleared ... we are talking about a marginal timeframe," Hanoch Barlevi, UNDP's chief technical advisor seconded to Mozambique's Institute of National De-mining, told IRIN. If donor funding had not subsided, Mozambique may have already lost its sobriquet as one of world's most heavily mined countries, leaving such countries as Angola, Afghanistan and Cambodia as reluctant holders of the title. Mozambique, a signatory to the 1999 Mine Ban Treaty (MBT), was granted a five-year extension of the 1 March 2009 deadline to remove all known anti-personnel mines and unexploded ordnance on its territory, saying that "Through a relatively modest investment [about US$39 million] on the part of both the Republic of Mozambique and the international community, Mozambique can indeed fulfill its obligations in a relatively short time." The government attributed its failure to meet the deadline to the size of the job - 123 of the country's 128 districts were identified as mine contaminated - the competing needs of demining and poverty alleviation in one of the world's poorest nations, and "some donor fatigue, which in turn resulted in a slow-down of efforts to implement Article 5 [of the MBT]." Article 5 of the treaty states that "Each State Party undertakes to destroy or ensure the destruction of all anti-personnel mines in mined areas under its jurisdiction or control as soon as possible but not later than ten years after the entry into force of this Convention [MBT] for that State Party." Exactly how many mines were planted during the conflicts is unknown - estimates vary from millions to about 500,000 - but whatever the numbers, there were enough to place the southern African country in the premier league of mine contaminated countries. Mozambique began to address the daunting challenge 17 years ago. There were no records or maps of where landmines were laid, memories had dimmed, witnesses to the laying of minefields had died, and some communities still feared retribution for informing the authorities about where mines had been planted. Landmines were widely used. The Portuguese colonial administration and Mozambique's first post-colonial government, ruled by the Frelimo party, used them for "defensive purposes" to protect infrastructure. In the civil war that followed independence Frelimo often commandeered schools to use as army barracks and surrounded them with landmines to deter attacks by Renamo, the anti-government rebel movement. Mine belts turned villages and towns into fortresses, as much for government soldiers to defend their positions "as to ensure control of population movement," a former Frelimo soldier told IRIN. Renamo would sometimes create phantom minefields, planting landmines by day in view of communities and then removing them clandestinely at night, but the effect of denying land to communities was the same. Mozambique's extraordinary progress towards becoming a mine-free state has been achieved by meticulously digging out the weapons - which have no expiry date - and more accurate assessments by deminers. The first survey in 1992 estimated there were about two million mines, but the Landmine Impact Survey (LIS) in 2001 - the first comprehensive survey, later recognized as flawed - said that about 1.5 million Mozambicans, or 9 percent of the population, lived in 1,374 mine-affected areas covering an area of about 561,689,063 square metres. Most information on the location of minefields was provided by local communities, but flooding in 2000 displaced thousands of people and the LIS was undertaken after the water subsided. HI's Ismael told IRIN that the "large number of suspected sites [identified by the LIS] did not represent reality", and the survey was undertaken by people who often did not have the technical skills to gauge the extent of a minefield. In 2007 the HALO Trust, which removes war debris, produced the Baseline Assessment after eradicating duplicate sites, conducting thousands of site visits, and collating data from HI and Norwegian People's Aid (NPA), and concluded that 12,166,401 square metres of Mozambique at a total of 541 sites were known to be contaminated. Having a mine-free state suddenly became possible, as the task of clearing more than 500 million square metres was reduced to a more manageable area of just over 12 million square metres within six years. However, after 13 years in Mozambique, the NPA closed its operations in 2006, following the exit of other international operators, such as the German deminer Menschen Gegen Minen (People against Landmines) in 2003, and the Washington DC-based humanitarian and commercial mine action and ordnance disposal organization, Ronco, in 2006, creating the perception that mines were no longer a major problem. Per Nergaard, the NPA director of mine action, told IRIN the organization was comforted that HALO Trust and HI remained in the country when the decision was made "to take our limited resources [elsewhere]." UNDP's Barlevi said the Baseline Assessment and NPA's decision to withdraw led to two different responses by donors between 2006 and 2007. Some donors used NPA's exit to close the chapter on their funding, while the findings of the Baseline Assessment encouraged other donors to return because the task had been defined. "The paradox is that the number of mine victims has dropped to a few a year, and if there was 50 mine accidents each year people would jump up, that is the irony. The human impact is going down, but it is not going away," Barlevi said. "There is less money around, and even less in Mozambique." According to Mozambique's 2008-2014 National Mine Action Plan, between 1993 and 2006, 269 million square metres were demined, 173,091 landmines were cleared and 133,143 items of unexploded ordnance were destroyed. The four northern provinces of Niassa, Cabo Delgado, Nampula and Zambezia are currently undergoing a verification process following the end of demining operations; the remaining provinces of Tete, Manica, Sofala, Inhambane - seen as the worst affected province - Gaza and Maputo had yet to be cleared. Landmines had also been found along 200km of the border with Zimbabwe, as well as in a belt around the Cahora Bassa dam, and beneath about 200 electricity pylons stretching 80km between the South African border town of Komatiepoort and into the high density suburbs of the Mozambican capital, Maputo. Further surveys were required in areas bordering South Africa, Zambia, Malawi and Swaziland. Helen Gray, HALO Trust's Mozambique's programme officer, like others in the demining community, is optimistic that the 2014 deadline can be met with "an increase in funding ... soon". They expect to have 208 deminers in the field by November 2009, but ideally require 364 deminers, excluding support staff and management, to meet the revised deadline. Gray said they needed about $4.2 million annually for the Mozambique operation, but were getting by with about $2.5 million. "Achieving a milestone like [demining the] Maputo [pylons] will help things," she said. 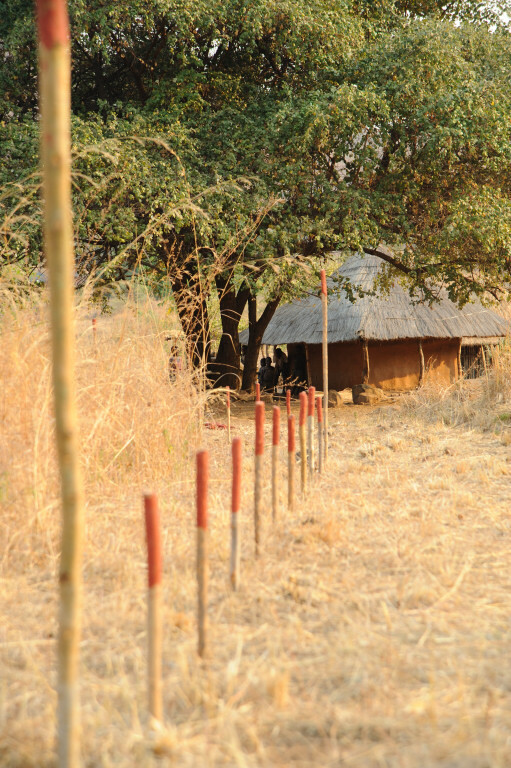 Peri-urban communities scratch a living on the vacant land along the corridor created by the pylons from Komatiepoort to Maputo, growing the staple maize and other crops, often within a few metres from the estimated 20,000 landmines planted along the pylon route. Up to 200 mines have been found at each pylon, planted by Frelimo to protect the electrical infrastructure from saboteurs during the civil war; it takes two or three deminers about a month to clear a pylon. "We are behind the curve ... but we still might meet the ... deadline by 2014," Gray said.